The Saturday night race at Richmond International Raceway couldn't have come at a better time for the NASCAR sprint Cup Series. Receiving some backlash for the lack of excitement through three of the past four races, the premier stock car racing series in the world was looking forward to the 2012 season's first attempt at the 3/4-mile short track oval in the state of Virginia. With the Mark Martin driven #55 Aarons Toyota starting on pole position for the second time this season, the 43 cars took the green flag for the Capital City 400 at Richmond. Martin led the first 29 laps of the 400-lap event until the #99 Roush Fenway Racing Ford wheeled by Carl Edwards took the led position of the NASCAR Sprint Cup field. As teammates Matt Kenseth and Greg Biffle have already secured wins in the series for 2012, Edwards finds himself in position to allow all three full-time Roush Fenway Racing runners to lock up early season victories throughout the Capital City 400. Due to an rainstorm earlier in the today that altered the track handling characteristics, NASCAR appeased drivers and teams with competition caution on lap 50 allowing competitors to adjust for differing race conditions from practice. At the end of the planned caution period, Carl Edwards reclaimed the race's lead and mobilized himself as a dominant force from lap 55 to lap 200. Behind Edwards in the first half of this 400-lap short track event for the 2012 NASCAR Sprint Cup Series, Jimmie Johnson had mounted a torrent run towards the top positions of the Richmond race. Starting back in 27th spot as the lowest-starting Hendrick Motorsports car in the Capital City 400, the #48 Chevrolet of Johnson would leave the event leading the team's only lap on the Sprint Cup field throughout the night on lap 310. While Jimmie Johnson and team were able to mount a solid effort to break into the top-5, their efforts were largely undone through an undisciplined pit stop on lap 312. An uncharacteristically sloppy pit service by the #48 Hendrick Motorsports team not only cost Jimmie Johnson position initially, NASCAR examination of the stop caught that a tire was not under the control a crew member resulting in penalty. Dropped to the tail end of the race field with only 82 laps remaining in the race, Johnson made a valiant charge back through the field but could only manage a 6th place finish. 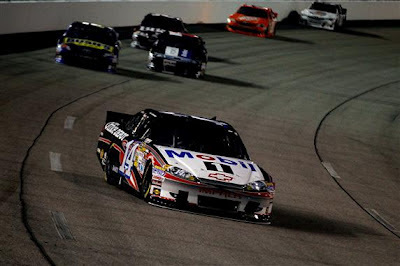 Through the second-half of the Capital City 400, the race appeared to belong to either the #99 Ford of Carl Edwards or the #14 Chevrolet of Tony Stewart. Collectively leading 324 of the race's 400 laps, the two 2011 point contenders were sharing the lead of the Richmond event. As a lap 318 restart appeared to shape up an interesting would eliminate the #99 car from a highly probable victory. Lined-up alongside Tony Stewart on the outside lane, Carl Edwards launched away from the #14 Chevrolet coming to the start/finish line. Aided by a dramatic spin of the tires from Stewart's car, the #99 Ford gained a huge advantage on a very strong restart. 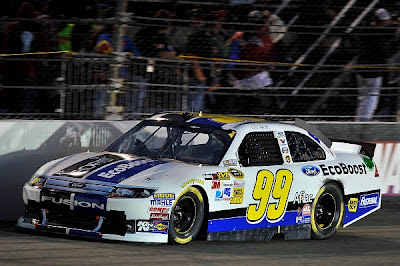 Unfortunately, Edwards' start would be concluded to be too quick as a review of field starting procedure clearly showed the #99 Ford jumping to the green flag on the restart. After 4 laps in the lead, Carl Edwards was directed to serve a pit drive-through penalty dropping him from first place to the tail end of the lead lap. Initially appearing as a debatable ruling by NASCAR, arguments circulated around the Stewart's slow launch to speed on the restart and the fact that the Richmond International Raceway's scoring pylon showed the #99 car in the first place spot coming up to green flag. After leading 206 laps, Edwards best efforts netted a 10th place run in the Capital City 400. While not a record, caution for the 400-lap race at Richmond was displayed only 5 times. The lap-118 spin by Kurt Busch's #51 Chevrolet was the only yellow flag event that was immediately triggered by a car out of control. However, there was a later caution for debris that also involved the #31 Chevrolet of Jeff Burton brushing the outside wall. With a total of three debris cautions, there was some speculation after the race on whether the yellow flag was thrown for legitimate reasons by NASCAR other than to just regroup the Sprint Cup Series field. Dominating the late stages of the Capital City 400 at Richmond International Raceway, Tony Stewart saw what could have been a sure victory challenged by a caution. With caution falling with 12 laps to go, Tony Stewart's plans went awry. As the leader pitted with a run in the final distance of the NASCAR Sprint Cup event at the short track, Stewart was beaten out of the pits by Joe Gibbs Racing's #18 Toyota piloted by Kyle Busch. On the final restart of the race, Kyle Busch's superb launch and another slip from Tony Stewart worked out to the advantage of the #18 car. Sailing across the line for his first NASCAR Sprint Cup race win since the summer race at Michigan International Speedway, the victory was the 4th straight for Kyle Busch in the spring event at Richmond. 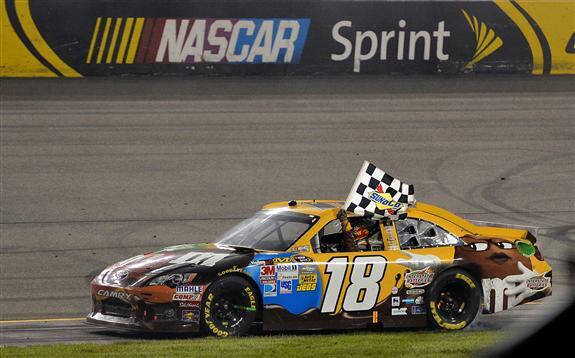 While Kyle Busch celebrated a familiar triumph after the short track's spring race, Joe Gibbs Racing also gained a 6th win in the past 7 Richmond International Raceway events. Finding his way around Tony Stewart on the restart, the #88 Hendrick Motorsports Chevrolet of Dale Earnhardt Jr grabbed second place. While Earnhardt Jr was in an ideal position for a final run on the #18 Toyota, weak brakes on the Hendrick Motorsports Chevy resulted in the car finishing more than a second behind. In position for the a third victory of the 2012 season, Stewart's finish in the second runner-up spot was not the finish the reigning Sprint Cup Series champion was really to embrace. Frustrated in post-race to has a victory slip away, Tony Stewart commented “When the caution is for a plastic (water) bottle on the backstretch, it’s hard to feel good about losing,”. Denny Hamlin finished 4th in the Capital City 400 while Kasey Kahne was the second-highest of three Hendrick Motorsports runners to finish in the top-10 ahead of Jimmie Johnson. A pair of Michael Waltrip Racing vehicles would take 7th and 8th at the end of 400 laps at Richmond with Clint Bowyer's #15 beating teammate and race pole-sitter Mark Martin. 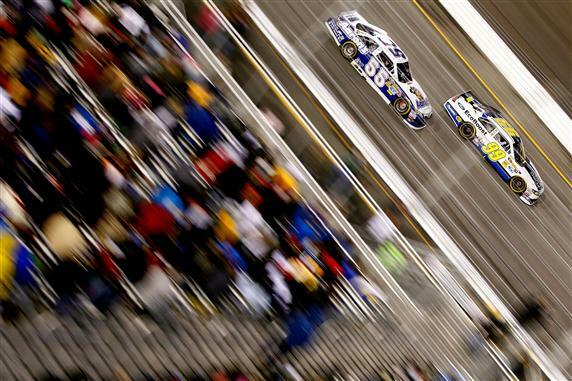 Brad Keselowski and Carl Edwards rounded out the top-10 of the event. Going from the 3/4-mile race track of Richmond International Raceway, the NASCAR Sprint Cup Series prepares for the high-speed Talladega Superspeedway.